That headline is literally criminal. The Sun should be prosecuted under the Trades Descriptions Act, because it is not a newspaper, it is a propaganda sheet, as well as for libel against a particular group of people (Muslims, not Al Qaeda) and under laws against inciting racial and religious hatred. I’m not a lawyer, you know, so this is probably impossible, since the law generally protects the powerful and squashes the weak, but basically, anything that’ll stick and bring the bastards down, crawling in the racist mud where they belong. I think the Murdochs and their Empire should be brought down now. James Murdoch allegedly may have lied before the limp Parliamentary Select Committee. My view is that they are likely to have lied systemically for many years about everything. Stick them in jail, sequester their assets. If they were a Trade Union, all of this would have been done years ago. Who wrote this crap? I think everyone, en masse, should write to the (admittedly toothless) ‘regulatory body’ and to the Sun’s editorial team to complain about the headline and the article. There needs to be a public investigation of this specific headline. Thousands of letters flooding in to both offices. Do it, now! “I believe the Sun is the best paper on the planet. It is a privilege to take over as editor and I cannot wait to get started,” Mohan said yesterday. !!!!!!!!! A few more exclamation marks. As you know, Craig, I posted that front page here last night around 2.30am on the ‘Decades of Bailout’ thread. At that time, Twitter was already alive with news of the arrest of the blond Norwegian 32-year-old. Prior to that there was NO information as to who was responsible for the massacre. So the Sun’s front page is pure invention. Surely “Norway’s Oklahoma” would be more accurate. I didn’t know, but that’s what you get for off-thread posting!!! The reports now coming in are really very affecting and it seems very likely that this event will have defining consequences for Norway and perhaps elsewhere, in the future. I too saw all the early Al Quaeda reports and was slightly perplexed, simply because it was so early in the timeline. Of course spurious ‘explanations are not new nowadays. It now seems par for the course. Many recent events have been wildly misreported and it is difficult to define exact reasons. Is there some kind of hair trigger hysteria in news reporters who wish to amplify their role and therefore their reputation as a central player, and their personal reward? In the one news event I was part of in my life, the mainstream journalists just seemed to make stuff up. ( It was a non-political story so there was no political motive) . It was very surprising to me at the time but I realized eventually that a particular reporter was busily mining the story for every penny he could get, and could not care what rubbish he spouted, as long as he was getting attributions, and I presume, fees, for getting his reports into the main news services, which were then picked up by individual outlets. For him, It was like finding a one-armed bandit with a jackpot psychosis, and the reporter could not stop, equally manically, pulling the arm until the machine was completely emptied. One of the surprising aspects of living abroad, is that the myth of the BBC very quickly unravels. Its influence and presence in the UK is quite overwhelming but it looks decidedly feeble from a distance and second rate, and the widespread acceptance of its authority that it enjoys in Britain looks likewise, rather feeble. While the demise of Murdoch may seem welcome. it is (or was) just one of the more extreme manifestations of what seems to be a very cohesive industry. One of the curiosities fog the Murdoch scandal has been the role of the Guardian. More and more its coverage looks less like a call for a radical re-assessment of the media but a commercial move, a radical re-assessment of its position, in the cosy relationship that exists between the news industry and politics. In other words it is a ‘circulation’ /commercial battle in a technically unstable period. and Rusbridger just wants to be the new ‘Broomks’, who slips into the back door of Downing street, has slumber parties at Chequers, or who provides an endorsement for his ‘insider’ in government. Will Marina Hyde be punted for a role in the press team in Downing Street? Curiously, Cameron has apparently offered every assistance in rooting out ‘the evil’ (of terrorism i assume). If so, he may have misread this moment, quite seriously. He might have offered the utmost sympathy safely enough, and any help the Norwegians might need, but rushing to define this hideous event in such a simplistic, dualistic way seems already mistaken. Is he now going to unleash the power of the state on the “right wing/religious fundies? He will maybe not have far to look, a good deal less than he may find comfortable. I suspect there are some elements of the Tory party and even the government, which are not so far removed from the ‘evil’. The ‘evil’ he may yet discover, has links and connections to us all, in ways we (and certainly not Cameron) don’t fully understand. As Craig reminds us in his post, the evil is ‘within’ in our rush to lash out stupidly before knowing anything. Cameron, to me, at the moment, just looks like a creature looking in the water, at his reflection, and finding it not as beautiful as he believes it to be, and gets furiously angry. It is a perfect illustration of the underlying narcissism of our leaders and the current way we do the ‘democracy’ enterprise. Is he now going to get even more intolerant in seeking tolerance and ever more authoritarian in imposing goodness? I’ve complained to the independent Press Complaints Commission [email protected] regarding the Sun and asked for a front-page apology in the same-size font as their disgusting headline. Hope many others do too. They haven`t forgiven or forgotten. I agree that Rupert Murdoch isn’t a fit person (although he’s in good shape for an 80-year-old). I think his wife’s quite fit, though! I bet you say that about Sarah Palin too. 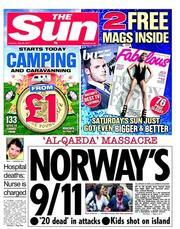 In what was being described as ‘Norway’s 9/11’, more than 80 were feared dead yesterday in a co-ordinated double terror attack. btw Mrs Louise Mensch was on Newsnight last night naming the Express and the Rothermere press for the same privacy invasion crimes as Murdoch. She is correct on this. What Price Privacy. 2003 Information Commissioner. She wriggled out of answering questions about her spat with Piers Morgan (he has called her a liar) and preferred to shelter behind her parliamentary privilege. Right, let’s just say it how it is. ‘Al Qaeda’ is a C.I.A./Mossad inspired media fiction and DOES NOT EXIST. Anyone who thinks otherwise has floated down on the last drop of rain and needs their tinfoil hat confiscated from them. I don’t know how many times I can keep spelling it out for media brainwshed people before giving up in frustration. All one needs is two brain cells to rub together to figure it out for themselves. I will try again for the unsure. Firstly, isn’t it incredibly odd that both the U.S. and U.K. each had one ‘spectacular, coordinated attack’ and nothing else since? Complete carnage and zilch follows other than messages from Bin Laden. Oh and many Hollywood style ‘foiled plots’ of course. And let’s not forget the Patriot Act and RIPA that both followed in the wake of these ‘events’. Secondly, how many illegal immigrants get into the U.K. every single day of the year? Plenty as everyone knows. And yet this Spectre-esque ‘Al Qaeda’ never gets through our borders to hurt us? Just think of the carnage one suicide operative could create once he got into the country on his own with minimal imagination! There are thousands of things one could do. ‘Al Qaeda’ DOES NOT EXIST. Plain and simple. If I recall, Mary, on Newsnight last night. Mensch, although sheltering behind parliamentary privilege, said that Piers Morgan used the present tense for the Mirror (that is the guidelines in force today) in accusing her of being a liar. Morgan was one of the better Fleet Street editors for me because he fervently and genuinely opposed Blair’s War on Iraq. I thought Mensch did not come across as being very creditable when it was revealed she had recently been exposed in the Mail, and, whatever we may think of the Mail, it did stink of revenge. Not only is the story a load of mis-informed crap, but the inclusion of the story alongside a cheap camping holiday offer is wholly inappropriate and pretty sick. Wish this paper would go the same way as the NOTW. How about ‘Norway’s Dunblane’, or ‘Norway’s Columbine’, or ‘Norway’s Winnenden’, or ‘Norway’s Alabama’, or ‘Norway’s Cumbria’, or ‘Norway’s Hungerford’…? There are plenty of such examples, yet the first one the MSM went for en masse did not even include any of these. How shameful, yet how typical. John Goss, good on you! Let the complaints flood in en masse. ‘Deepgreen’, thanks. David Cameron is a man seriously out of his depth. As a point of clarification, may I just offer a quote on the Norwegian massacre that describes the suspect as being far-right. John Goss I have written to the PCC asking them to take action against the editor Dominic Mohan and the proprietors News International. Your recollection of Newsnight and the Mensch segment is probably more accurate. Here is the recording beginning at 14mins 15secs in. Only available for six more days. A piccy of Wade/Brooks arriving with Mohan at a Freud party. For her ‘present tense’ argument Mensch referred to a statement made to Newsnight by the current Mirror Group, but I doubt she’s any concrete evidence of phone-hacking by Piers Morgan at the Mirror. In fact she’s not very convincing at all, and did not perform well against a former hack, Wensley Clarkson, who quite fairly asked why she had such a gripe against Piers Morgan. So my recollection wasn’t as good as it should have been. I’m sure, as Dreoilin’s link shows, phone-hacking went on under Piers Morgan, but he’s not likely to put it in writing, or go on record in any other way.